RadGridView provides you with a built-in filtering functionality, which allows the user to easily filter the data by one or more columns, just by clicking on the filtering icon next to the header text. You can define filtering either in the XAML or in the code-behind. You can achieve the same result if you define your filtering in your code-behind like this. Note that since FilterDescriptors property is a collection, you can add more than one FilterDescriptor to a RadGridView. You could localize those strings. For the complete list of the localization strings please check this how to topic. The list of filter operations depends on the DataType property of the column. For example, the filter operations "StartsWith", "EndsWith, "IsEmpty, "IsNotEmpty... " will not be available for columns of Integer or DateTime types. Consider using the code-behind approach only when changing the filtering criteria run-time. How does the basic filtering work. 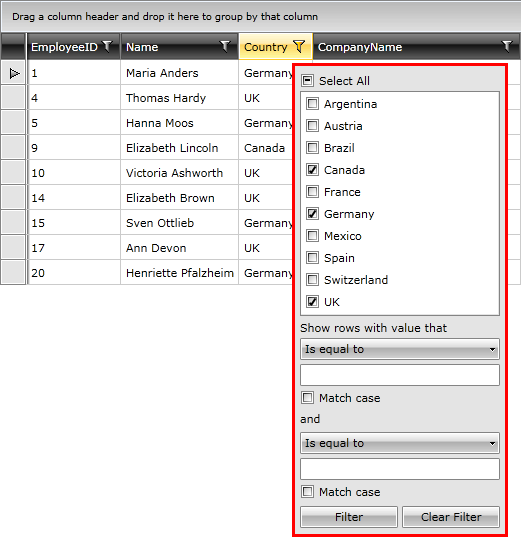 How to style the column header of the filtered column.